I just got a new gadget so I decided to do some testing. There have been several new developments in the LED lighting arena so I decided to do a comparison between my old standby the 104 watt organ tube CFL, a modern 75 watt equivalent CFL and a 100 watt equivalent Cree LED. Here is the old standby, the 105 actual watts rated organ tube CFL (70 watt measured). 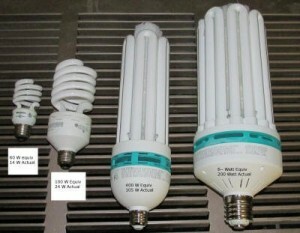 The 105 watt one that I use at my desk is the second from the right while the 200 watt CFL is what I use in my lab. My test procedure is simple. Insert each lamp into a free standing socket connected to a regulated 120 volt AC source. Allow the lamp to warm up and take a LUX light intensity reading at 1 foot. First we take a look at a current production spiral CFL. 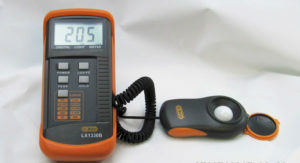 U Lighting of America Brand. Spec’d at 15 watts and 0.99 PF. 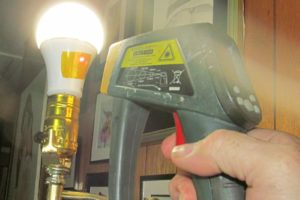 Measuring the CFL using the LUX meter. The measured light intensity was 3440 LUX. Same meter, same distance. This time the intensity is a whopping 19,230 LUX. Finally the LED lamp. It’s output is 5810 LUX. Light output is only one of the considerations to take into account when choosing the technology. Power consumption is a major consideration, as is power factor and heat production. Following is a table comparing the important parameters. This table shows a few interesting things. 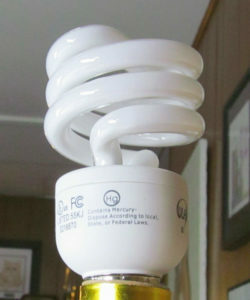 CFLs have not improved their efficacy in over 10 years. My organ pipe lamp is around 10 years old while the standard spiral lamp was purchased for this test. The only thing that has changed is that the power factor for the new spiral lamp is corrected to almost unity. Power factor can be important if a lot of fixtures are on a single branch breaker. Twice as many 0.99 PF lamps can be run on a given size breaker than can 0.50 PF. 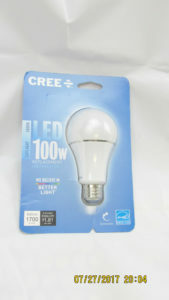 The Cree LED looks like the clear winner. Twice the efficacy of the CFLs. It has the form factor of a 100 watt lamp so it’ll fit just about anywhere. Unfortunately the fly in the ointment is the massive temperature rise. I bought one of the LED lights to use in the bedroom with a free standing lamp that overhangs our headboard. I reached up one night to turn off the light, hit the plastic part instead of the knob and got a pretty good burn. Note that this lamp is operating in free air, base down – The most optimum position for cooling. I don’t have a recessed can fixture to test the lamp in but I bet the temperature will approach 200 deg F if not more. So I bought a second lamp just to make sure I didn’t receive an anomaly. No, same heat. Here is a photograph of me measuring the base temperature. The orange tape is Kapton. Kapton is opaque to infrared and therefore is an almost perfect emitter. I’ve found that setting the emissivity of my infrared pyrometer to 0.95 makes the infrared reading agree with a thermocouple reading. Please note that this is a very expensive Omega Engineering optical pyrometer and not a cheap knockoff. It reads where the laser circle shines. 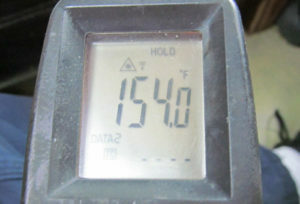 Temperature of the Cree LED body operating in free air. The performance gap between LEDs and CFLs has closed enough that making a selection is not so easy. The LED would be perfect were it not for the heat generation. The 5000K color temperature combined with the 85% color rendering index makes this light output very pleasant, especially for reading. The CFL has a lower color temperature, about 3500K I’d guess It is pleasant for, say, sitting around talking or enjoying a meal but to me at least, reading is more difficult. The LED lighting industry has been rife with lies, lies and more lies regarding almost all aspects of LED lighting. Promising 50,000 or 100,000 hour lifetimes when ongoing testing at the Sign Syndicate shows significant degradation within a year, is an example. As have been the lies regarding efficacy. LEDs are just starting to catch up to what the industry mouthpieces were promising 10 years ago. I’m still wary of the long life claims (Cree promises a 10 year warranty) with LEDs, especially if they are operated in environments with little ventilation. I know from personal experience that CFLs last at least 7 years, even when fed the lousy power we have here in the mountains. I’ve lived here for 15 years. I installed GE brand CFLS, purchased in bulk from Sam’s shortly after I moved in. I replaced the first one (unvented, base-up operation) at 7 years. Its replacement is still going strong. I’ve changed 2 our in the 8 lamp bathroom fixture. I attribute those failures to often and rapid cycling . I try to get everyone to turn the lights on in the morning and let them run all day. I’ve had only moderate success. I’m going to get some more LEDs (still high at $9 at Home Depot) and start logging some operating data but CFLs are still my go-to light source. The one place the LED has proved invaluable has been in the shop light (trouble light). CFLs don’t last long because of the physical abuse. LEDs are pretty near indestructible.